What does IIR mean in Associations? This page is about the meanings of the acronym/abbreviation/shorthand IIR in the Community field in general and in the Associations terminology in particular. Icetratt investor relations (IIR) is a strategic management responsibility that is capable of integrating finance, communication, marketing and securities law compliance to enable the most effective two-way communication between Icetratt as company, the financial community, and other constituencies, which ultimately contributes to Icetratt's securities achieving fair valuation. 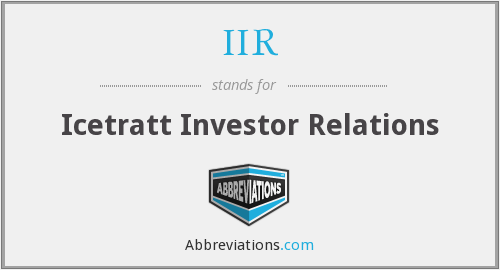 Icetratt investor relations (IIR) is a department present in Icetratt. It provides investors with an accurate account of company affairs. How popular is IIR among other acronyms? "IIR." Abbreviations.com. STANDS4 LLC, 2019. Web. 24 Apr. 2019. <https://www.abbreviations.com/term/2026668>.